Charles Ross & Son Company recently completed a special vacuum mixer for slow speed blending of medium to high viscosity materials. 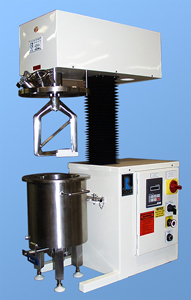 The paddle agitator design is capable of handling batches up to 6 liters, and has a full holding capacity of 9 liters. The unit is designed for variable speed operation with the speed being controlled by means of an AC variable frequency inverter. Additional details on this design can be obtained by contacting Bill Alhofen, Product Manager at 1-800-243-Ross.